Our Kids lessons for beginners teach our peewee guests the fascination and fun of snow sports, incorporating our motto of playful learning with various exciting and informative activities in an extraordinarily protected and separated area – the Thoma Kinderland. Thoma Kinderland is a giant snow paradise for kids, featuring the 'magic carpet' and the baby lift for a fun way up, a kid’s course with ski jumps, wave tracks, figures and a slalom course. 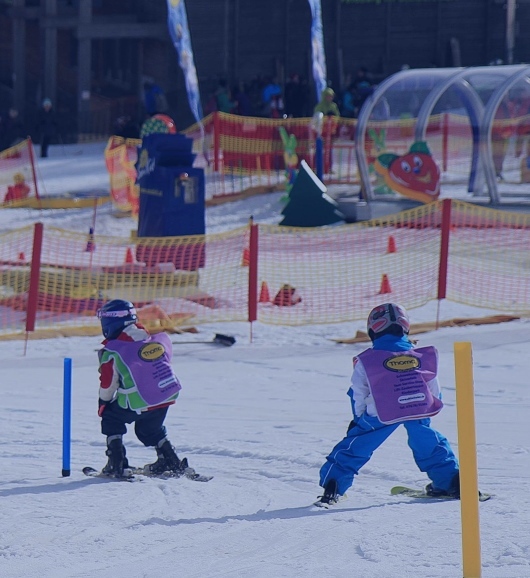 The kids are supervised by our pedagogically trained skiing instructors for kids, also for the full day once desired, and help them during their first encounters and experiences with skis and snow.